We are very pleased to introduce a new member of our Change Makers teaching team. The recruitment process concluded back in early October and we had a staggering field of qualified, motivated and inspiring candidates. The selection process was incredibly difficult, but we were very pleased to offer the position to Daisy Pataki. Daisy excelled at interview, telling us stories about her design and implementation of active and informal learning alongside her more traditional experiences. 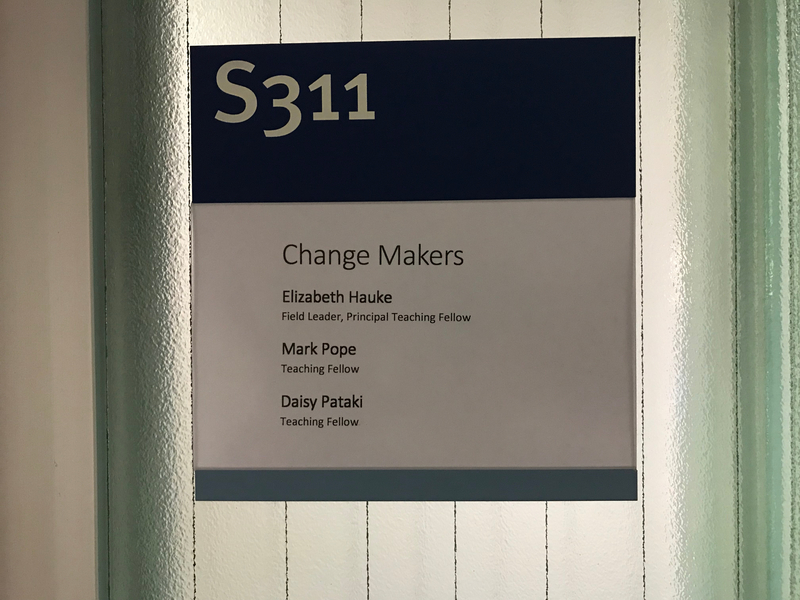 After two months of squeezing in visits to our classes and joining our co-learning team to work with our first year students, we were finally able to properly welcome Daisy as a Teaching Fellow in December. I am a geologist with experience in industry, research and teaching. I spent three years as a University Teacher at the University of Glasgow and loved every minute of it (well, maybe not the marking). As my recent contract as a Research Associate at Imperial was coming to an end, I was looking for an opportunity to return to teaching. I had planned to remain within the realm of Geology and Earth Science but when I saw the Change Makers post advertised I became intrigued. I looked into the Imperial Horizons programme, and Change Makers in particular, and determined that it was a good fit for my teaching philosophy. I also really appreciated the idea that students would be brought together from their individual discipline silos to learn collaboratively about a topic they found mutually interesting. I believe this is an excellent opportunity for our undergraduates to broaden their university experience and can be incredibly valuable for their futures. When I realised all of these things, it was obvious that I had to apply for the post. What particular strengths will you bring to the teaching? I bring years of experience in higher education from my time both as a student and as a teacher at universities around the world (USA, NZ, Scotland, England). I have a science background and therefore understand what the undergraduate experience is like for our students. However, my undergraduate science degree is from a liberal arts university in the USA. The liberal arts philosophy holds that students should have a broad understanding of the world by the time they graduate. Therefore, although I took many science and maths modules to earn my Earth Sciences degree, I also took modules in linguistics, architecture, history, Latin, visual arts and others. The fundamental concept of the Horizons programme fits well with the liberal arts style of education and it therefore feels completely natural to me to encourage our students to work in this way. Additionally, I have worked as a scientist in industry, research and academia. Many of our students will wish to pursue employment in these fields and my background will help me to prepare them for that. Lastly, I am interested in the global energy system, having worked in both the oil & gas and geothermal industries. I will use my firsthand knowledge to inform my teaching of this complex topic. I look forward to bringing all these experiences to the Change Makers students. What do you hope to gain from this role? I expect to be challenged and to broaden my teaching skills. In the past I have taught traditional lectures and labs, as well as in the field (for example, geologic mapping). I have always tried to incorporate student participation, but the Change Makers modules bring that to a whole new level! I believe I will grow as a teacher as a member of this team and I’m looking forward to it. I also really enjoy working with students so I look forward to the satisfaction of leading them through modules which will likely be unlike any they have taken previously. It should be fun! What do you expect some of the challenges will be? The main challenges that I foresee are: getting students on board with a new way of learning, keeping them engaged in something outside their comfort zone, and learning how to do it myself. I have often found that students, especially science students, struggle with open-ended questions and a lack of *the* answer. For example, a geological map is based on the rocks and measurements one can take at the surface. The rest of the map is the interpretation of the mapper. Many times I have seen students struggle when they ask me if their map is “right.” I ask, “Does it fit your observations?” and if they answer in the affirmative, I reply, “Maybe.” The students invariably groan. Unless we were to strip all the soil from the earth we would never know if their map is “right,” we can only confirm that it fits their observations and thus there is no “right” answer, there are many possible answers. In Change Makers we will be encouraging the students to think creatively and to imagine futures or ideas that *could be* right; I expect this may be quite tricky for some of our students to accept. Additionally, they will be challenged to interact with their learning in new ways. I think maintaining enthusiasm and encouragement will help the students work beyond their comfort zone. I also think that the teaching style will be challenging for me personally. To be so interactive with the students requires large amounts of energy; I expect that it could be challenging to maintain that energy throughout the 20 weeks of the higher level courses. It is also quite daunting that we provide students with feedback within one week. I think it is hugely beneficial for the students that we operate that way and I support it. I also think it will be quite intense for those of us delivering the courses. It will require good planning to ensure that we space the assignments out such that different classes aren’t turning in assignments at the same time. I’m looking forward to these challenges. How have the first few weeks been? It has been very interesting so far! My first few weeks have focussed on familiarising myself with the programme and modules and getting a flavour for the student work. I saw the work that the first years produced during The World Today course and was incredibly impressed with their creativity and presentation skills (more on that in a future article). I likewise saw the work-in-progress of the second years, from sketchbooks of ideas to solve problems in Tamil Nadu to video diaries of “a day in the life” of the students focussing on sustainability, happiness and SMART living. Once again I was impressed with their levels of creativity. Lastly, I saw the wiki maps that the Lessons from History students produced while learning about the Los Angeles riots of 1992. As an American, I recall the LA riots, but I nonetheless learned so much from the work that our students did and it was presented in a way that was incredibly effective! I’m really looking forward to next term when I will start integrating with the courses and students more. And lastly, I am really excited to learn from Elizabeth and Mark who have put together such an innovative and exciting programme of modules with a distinct pedagogical style.